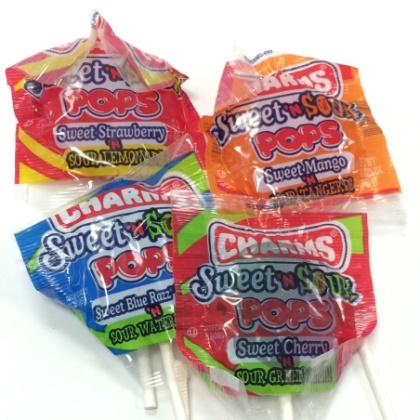 Charms pop has a sweet and sour flavor swirled together. New assorted flavors. Sweet strawberry and sour lemonade, sweet cherry and sour green apple, sweet pineapple and sour grapefruit, sweet blue raspberry and sour watermelon and sweet mango and sour tangerine. 16 ct. bag. All of the different flavors taste just as I remember them as a child. They were shipped promptly and I will order more.